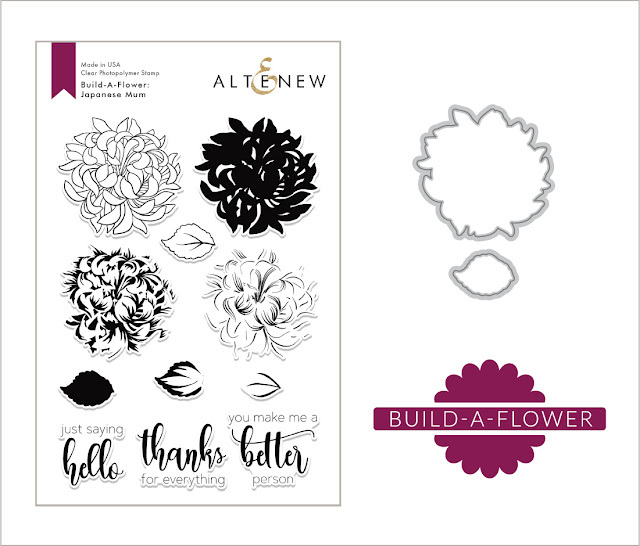 Hello Lovelies, I am excited to be part of Altenew’s Build-a-flower Japanese Mum release blog hop. This is a gorgeous layered set and also has coordinating dies. You should have hopped into my blog from the gorgeous Therese’s Blog. If not do not worry, I will list all the participants of this hop later in the post. I have a set of three cards to share with you today. The cards share three different ways you can use this beautiful layered Japanese Mum stamp set. This set has the outline image and three layering image. Each card showcases combination of layers and outline image of the flower. This one uses the outline and one of the layers of the flower and similarly the leaves. 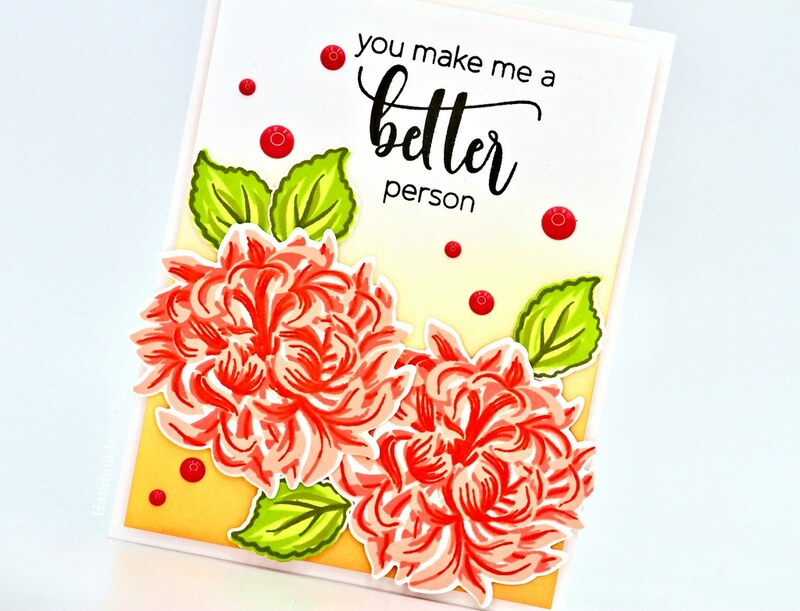 All the cards use similar process of creating the card for example, background sponging, cluster of flowers, white spaces, enamel dots and sentiment on the white space. The difference is the colours, layout and how the flowers are stamped. Here are the closeup of this card. The second card uses the outline as well as two of the layering images of the flower and leaves. I just changed the colours, orientation of flowers and leaves, the background sponging and layout. I used a different sentiment from the stamp set on this card. Here are the closeups of this card. Absolutely adore the layering details of the flowers in this stamp set. Here is the third card. On this card, I did not use the outline image on the flowers. Again changed up the colour, orientation of the flowers, sponging on the background, layout and sentiment. Totally different card. Here are the closeups of this card. You next hop is to the talented Emily’s Blog. Here is the list to all the designers participating in the blog hop. I am also giving away a $20 gift certificate from my blog. Make sure you leave your comment below. I will announce the winner promptly this on 6th of Feb. You have until 5th Feb midnight to leave me a comment. Thank you very much for visiting my blog today. I have listed all the supplies I used to make these cards below. Wonderful! All of your cards are beautiful today! Your cards are all so pretty! OMG-when I saw your cards, my jaw dropped, the markers came out & my fingers started itching to create!!!!! You’ve got talent and I always go to your blog for inspiration! Thank you for sharing your inspiration. I love your pretty cards! All 3 are great! Your cards are lovely. The bright colors really showcase this awesome stamp set!! Beautiful examples using this set. I love your cards — especially the first two so I guess I’m partial to the contrast of the outline dies. : ) The soft yellow/white grey is so lovely. You have such a good touch — and eye. Those are breathtaking cards – I love the vibrant, sunny colours. Lovely! I really like how you had a basic formula, then changed up the colors for some unique cards!! Gorgeous cards, and thanks for sharing 3 different card designs with this fabulous BAF set. Your cards are just beautiful!!! Every color ……makes me want spring to start here…..thank you so much for sharing your lovely work..
WOW Gayatri, they are all gorgeous! I love all the different looks achieved with the one stamp set! Amazing work! Your cards are absolutely beautiful Gayatri, the wonderful bright colours that you chose are perfect! Such beautiful cards! I love all the different colors you used with the new set! Love your cards. The colors are really beautiful. Beautiful looking cards. Thanx for the ideas. Such beautiful cards!! I love the orange with no outline! Love the Build-A-Flower ideas that all the designers are showing. So many ideas with all the different colors that the flowers and leaves are built with. 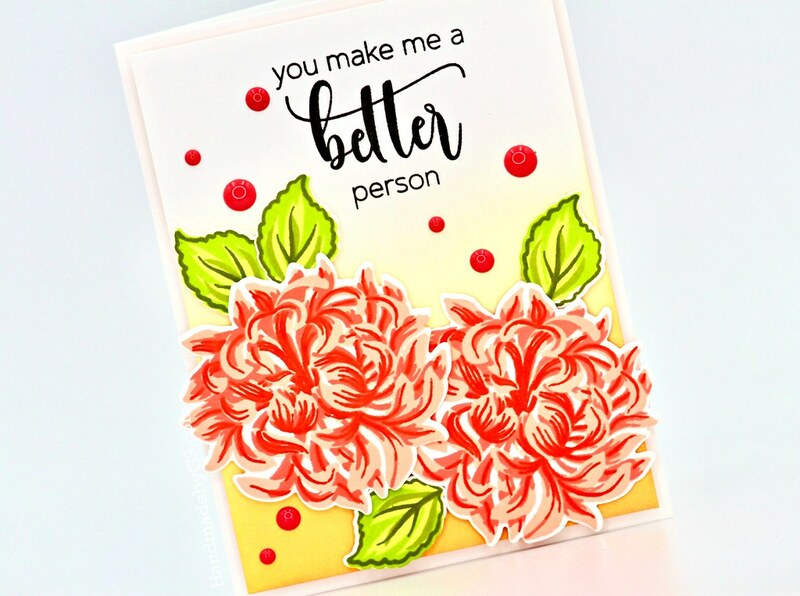 Gayatri, I love how you colored these beautiful mums and each layout of your cards is so striking, too. Thank you for inspiring! wonderful Build-a-Flower designs, so many ideas that are great. Thanks for sharing. Really beautiful results, great way to mix up.stamps, not using every layer looks as stunning as all. Thank you for sharing & inspiring. They’re all beautiful cards! If I have to pick just one, however, I love the one with the yellow & gray hues, perfect illustration of the lovely Japanese mums! Love all of your cards, Gayatri! This new Build a Flower set is just so gorgeous. 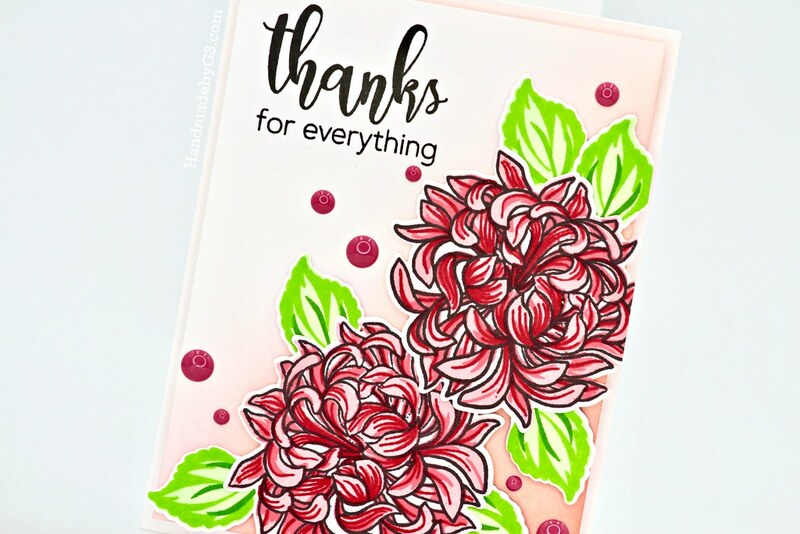 Lovely color combos and details on your beautiful cards! Love the new BAF set! All your cards are fabulous. Love how you colored the mums. Love this gorgeous BAF set! Your cards are breathtaking Gayatri, the color combos are stunning!! Thanks for the inspiration! Gorgeous cards using the new Altenew Japanese Mum. This is a wonderful stamp and die set. Thanks for inspiring me. So many super pretty cards, Gayatri! I love all the colour combinations! As I went to each one, I thought it was my favourite! Now it’s too hard to choose! Thanks so much for sharing as well as the great inspiration! You created some stunning cards–love them! All 3 cards are so pretty… think I like the 3rd warm card best, but hard to choose. It’s a lovely stamp set! Stunning! Though your cards are very similar, they are alo very different and I love them all. Thanks for showing how you can use just some of the layers and still get beautiful images with this set. So bright and cheerful. Great use of the stamp set. Thanks for the ideas. It almost looks like warmer weather may really be on the way. Nicely done cards! Thank you for sharing your techniques with us! Gayatri you’ve made such a lovely variety using this Japanese Mum stamp set. Each one has something special to offer & you’ve showcased it beautifully. Your cards are fabulous. Beautiful coloring on them both. 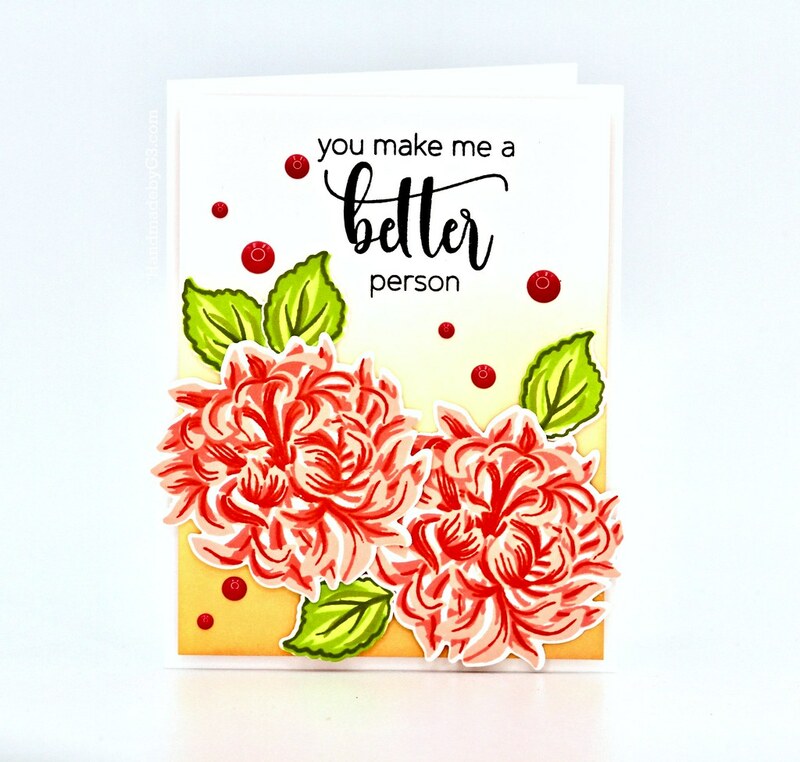 gorgeous cards, Gayatri – love all the various colors you chose! Love the backgrounds and details of your cards. Lovely job. Thanks for sharing! Such a nice selection of cards. 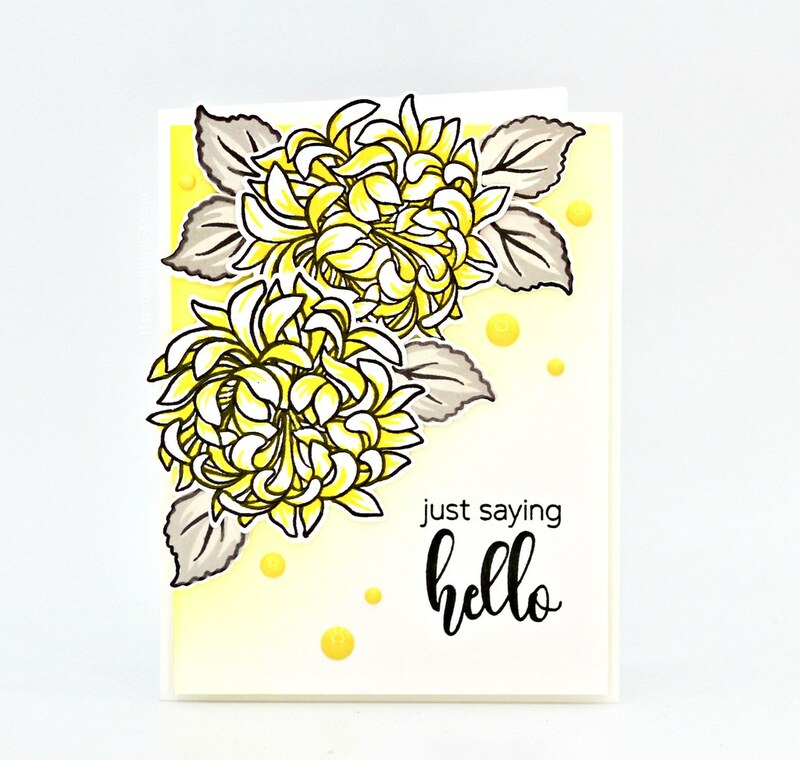 Love all three of your cards….each one a little different, which makes this stamp set even more versatile! Love the bold colors you chose! All of your cards are beautiful! I love how you can use just one or two layers of this set and it still looks amazing! Thanks for all the inspiration! This flower looks beautiful in every color! Great cards. Such beautiful cards! Love the vibrant colors. Gorgeous cards. Love how the flowers pop. TFS. Your mums are all GLOWING! I love the bright beautiful colors and designs! What gorgeous cards! I love how you blended the backgrounds! The orange and yellow one is my favorite- such a bright, beautiful card, just in time for Spring! 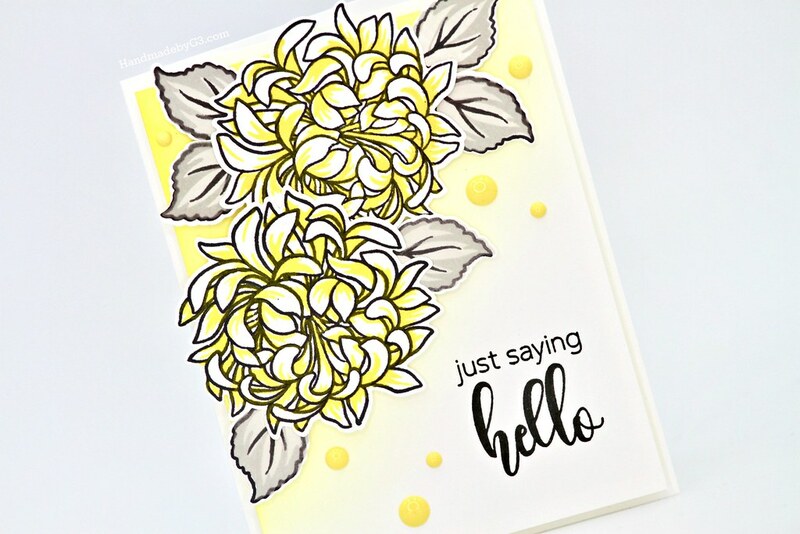 Love your cards, especially the yellow and gray one. This stamp set is awesome! Love the yellow and grey one! What fun color combos! 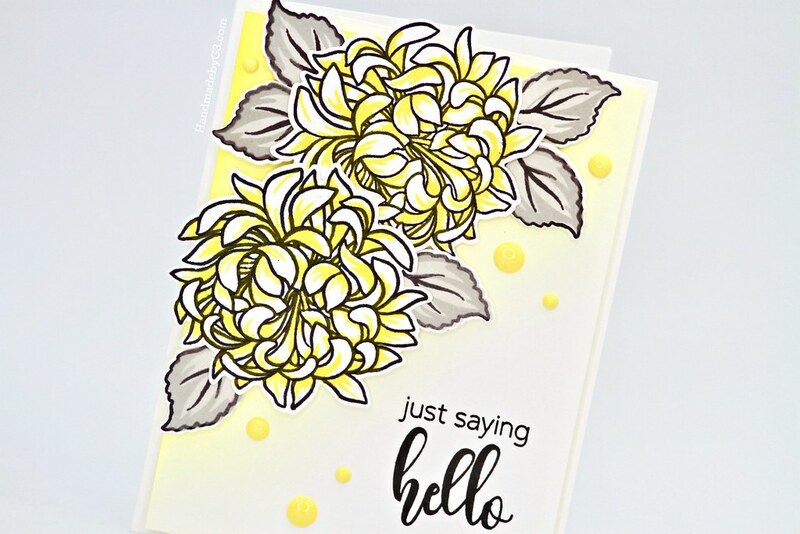 Yellow and grey are not colors that I often go for, but I really like how your card turned out. Thanks for sharing your lovely cards with us! Very pretty cards! That yellow card makes me so happy, like rays of sunshine! Beautiful backgrounds. The blending really emphasize the colors of the flowers. Beautiful cards! I love how you used different layers for each card. They are all beautiful! Beautiful card. The colors are gorgeous. I love this wonderful Japanese Mum BAF. luv all of the contrast! it makes your flowers so bright!! Beautiful cards and color combinations. I am particularly drawn to your yellow and gray combo. I love this Japanese Mum Stamp Set. Thanks for sharing your designs. All three of your cards are gorgeous and I really enjoyed seeing the different ways to use the stamp set! 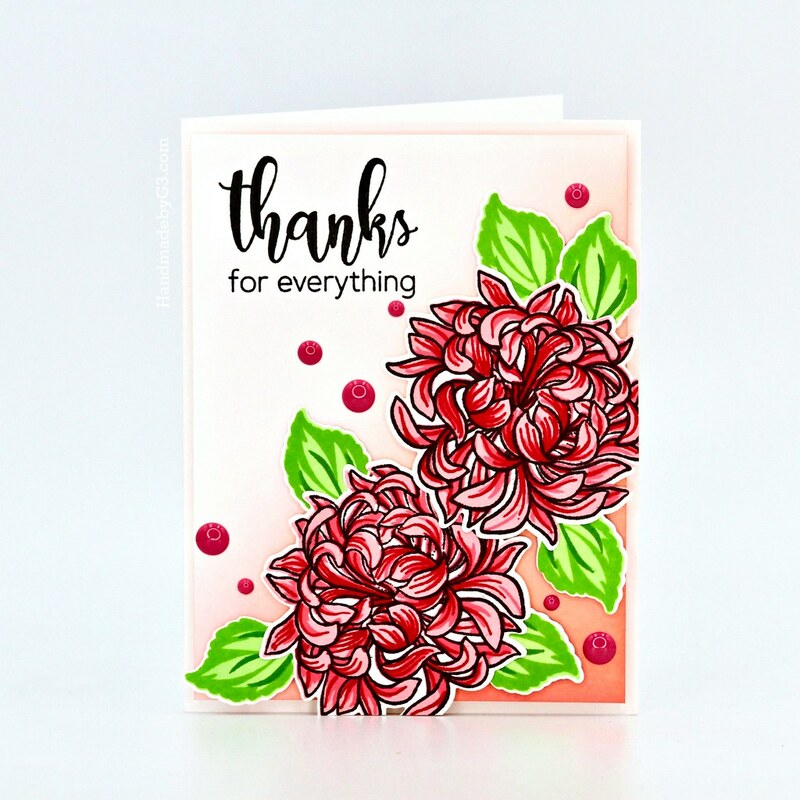 I love your last card, the Warm and Cozy color combination really looks amazing and I think the Mum looks fantastic without the outline image, it really has such beautiful detailed layers. All your cards are spectacular. The background shading and the enamel dots really added the extra touch! Thanks for sharing your work. Gorgeous cards! I absolutely love your color choices and designs. Fantastic! Absolutely beautiful cards! I love love love the colors with the black sentiments! This has to be my favorite BAF set! It’s a must have for my crafty stash! Such beautiful cards! I love colours and the background colouring you did! I love the results you achieved with the different number of layers you used on the cards. Very nicely done! Such gorgeous cards! I love that you showcased the awesome Mums in several different colors. Wow! Love all of your cards. But something about this set looks really great in yellows. It looks so bright and “happy.” Thanks for the inspiration. It’s amazing how many beautiful color and layout combinations you’ve shared! Each one is lovely and wonderful! Thanks so much for sharing!!! Thank you so much for sharing these three cards with us! The colors you selected are just beautiful. They make me so excited for Spring! Your cards are lovely. I like the background sponging. I think those last flowers are my favorite, but they all look great.